Is being a Christian compaible with supporting the BNP? If you wanted to know something about the core values of Christianity, then the person to ask should be a knowledgeable expert. One such person is the former Archbishop of Canterbury Lord Carey. After watching BBC's Question Time, Lord Carey described the BNP’s policies as "despicable" and nothing to do with Christianity. Lord Carey described Nick Griffin as a "squalid racist" who was trying to "hijack one of the world's great religions". Being a Christian is not merely believing in Jesus. If your actions are not based on Christian values then you are NOT a Christian. The UK is based on Christian values. Being a Christian is not compatible with being a supporter of the BNP. Amir Khan visits Southall again, to lend support to Southalls attempt to base the Pakistan 2012 London Olympic team in Southall. The President of the Pakistan Olympic association, Gen (Retd) Syed Arif Hasan visited Southall on Thursday to see if the local facilities were suitable to house the Pakistan Olympic team. The Southall initiative is led by local business leader Dalawar Majid Chaudhry, who said "We have the capability, the community spirit and support, the vibrant cultural benefits and above all the cuisine, to host Team Pakistan." Southall would be a "home away from home" for Team Pakistan. In the evening a press conference was held at Chaudhry’s TKC restaurant. Those present to greet Gen (Retd) Syed Arif Hasan and his guide, an Olympic official, were Ealing Southall MP Virendra Sharma, local councillors, Ealing Council representatives and fans of Southall's adopted "Role Model". 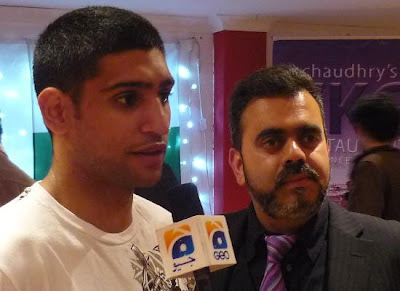 Special guest of honour at the event was Southall’s "Role Model" boxer Amir Khan. He dined at the restaurant before the conference. After the conference he signed autographs and was happy to be photographed with his fans. "Money for food. Money for food. Money for food." is a constant mutterings of a begger on Southall Broadway. You can hear him all day - 7 days a week. Is he really begging for food? One old lady, even when told to ignore him, felt sorry for him and gave him £5. Lucky begger. He crossed the road to the other side of Southall Broadway and went straight into the bookies. Money for Food. Money for Food. Money for Food. Money for Gambling. Money for Gambling. Money for Gambling. A new bookie opened up, at the location of the old petrol station, on Southall Broadway. Another one wants to open up just opposite. All the beggers on Southall Broadway are professionals. They work all day - 7 days a week. If you don't see them, they have merely moved elsewhere temporarily.